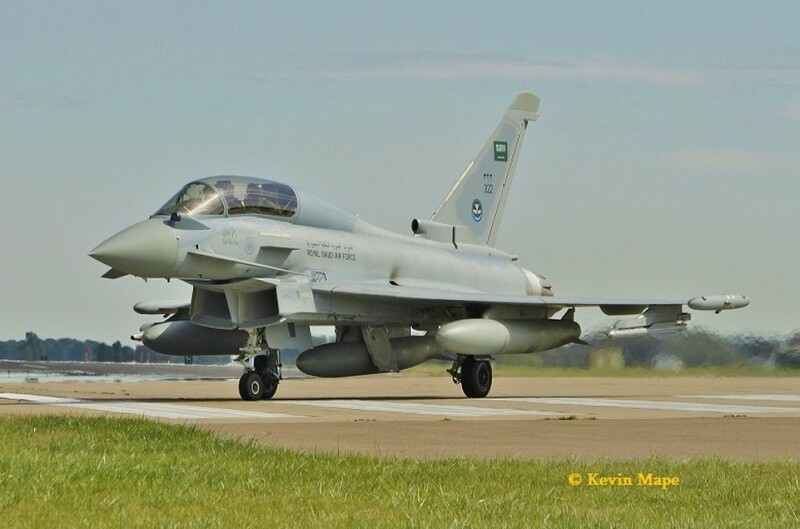 RAF Coningsby welcomes Aircraft and Personnel from the Royal Saudi Air Force for Exercise Green Flag , This Exercise is due to start flying missions at the beginning of September and run for two weeks but Saudi aircraft are due to be deployed at Coningsby for 4 weeks, It is six years since the last RSAF deployment to the UK , On that occasion it was Tornado aircraft to Lossiemouth in 2007. Four RSAF C-130H arrived on the 23rd August at Coningsby with the first loads of cargo for the deployment with aircraft routing from TAIF to Heraklion – Crete for a fuel stop then on to Coningsby , Two hour aircraft turn rounds with fresh crews flying back to Crete for a fuel stop then on back to Saudi, A further four flights arrived on the 24th with another three aircraft on the morning of the 26th. 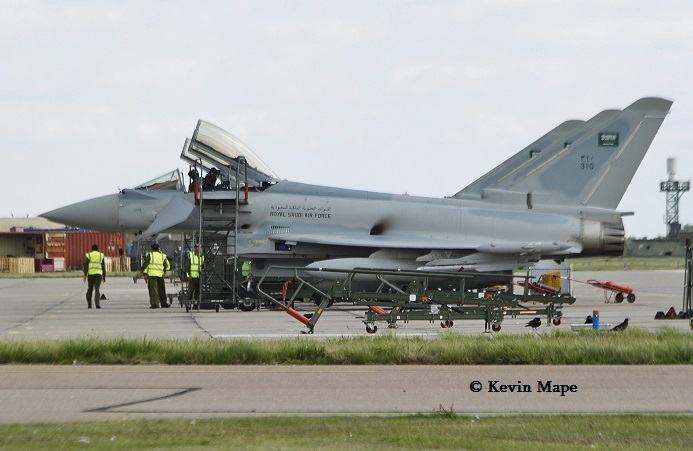 All the cargo being unloaded is being stored outside 29Sqn hanger. 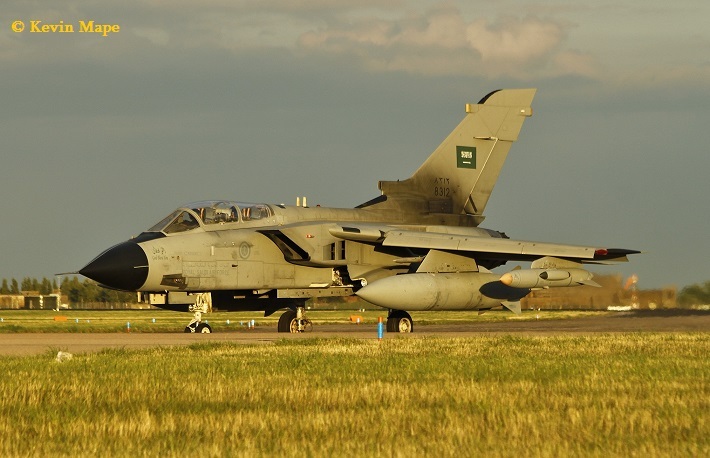 The exercise will see for the first time visits of both Tornado & Typhoon of the RSAF to RAF Coningsby. 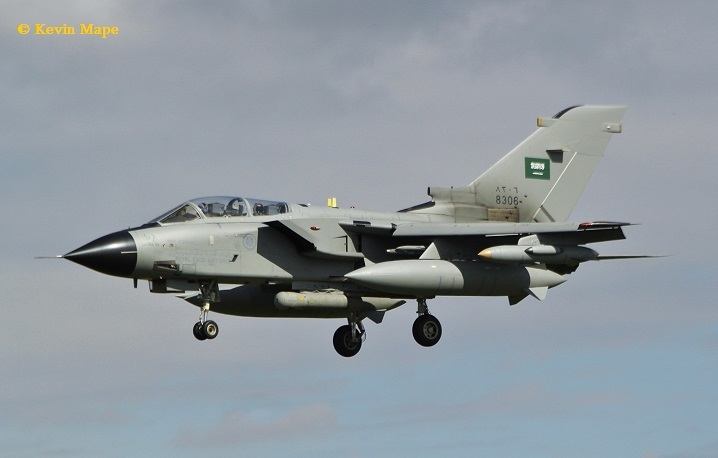 3(F)Sqn will be the host for the Saudi Typhoons for the exercise and Tornado’s from 9Sqn deploying to Coningsby from Marham will host the Saudi Tornado’s. 2401/24Sqn/Airbus A330-243-MRTT c/s RSF 3871″ – To Brize Norton – Night stopped- Departed. 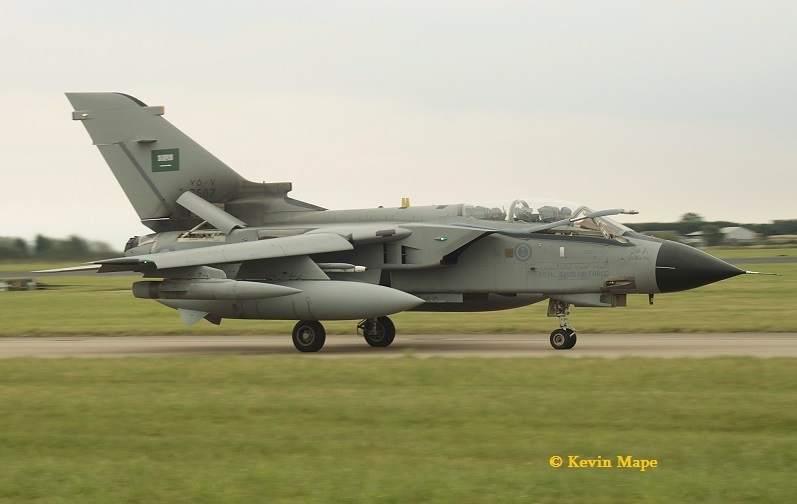 The Airbus had re- fuelled the 4 Tornado IDS on there first leg from Saudi to Italy. 483/4Sqn/C-130H Hercules c/s “RSF 3903” – To Coningsby -Departed. 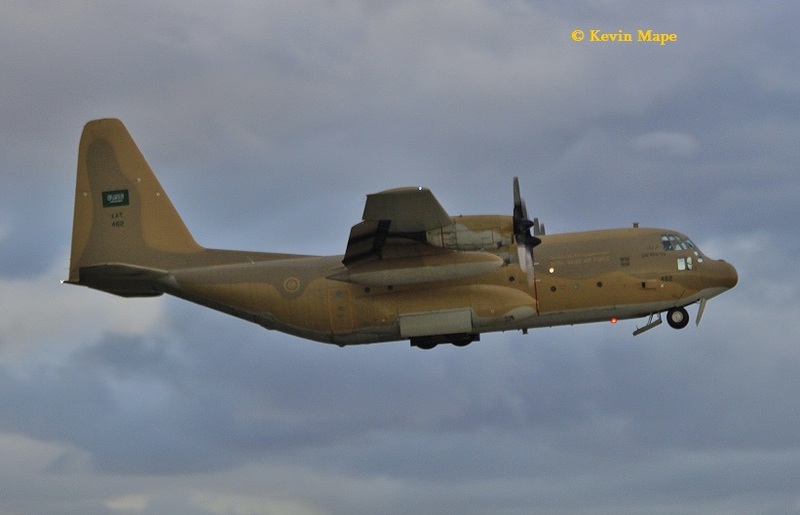 475/4Sqn/C-130H Hercules c/s “RSF 3904” – To Coningsby – -Departed. Photo :- 475/ 4Sqn C-130H arriving at Coningsby 23rd August. 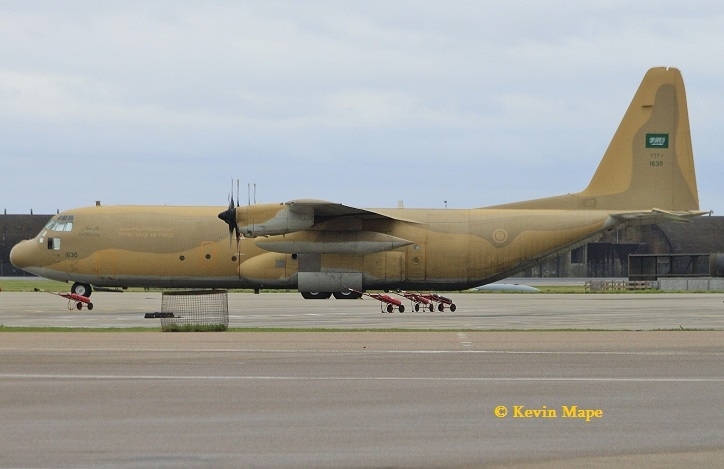 1623/16Sqn/C-130H Hercules c/s “RSF 3905” – To Coningsby – -Departed. 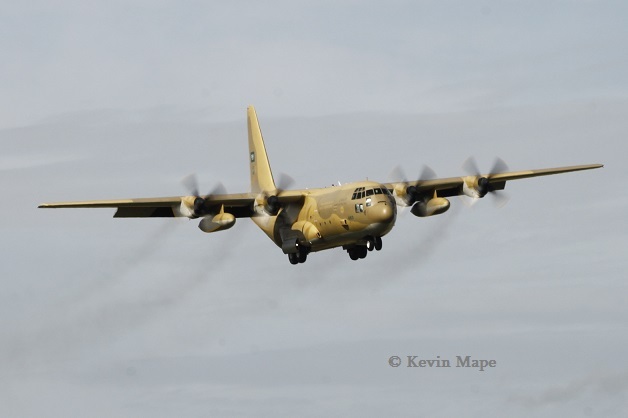 Photo : 1623/ 16Sqn C-130H departing Coningsby 23rd August. 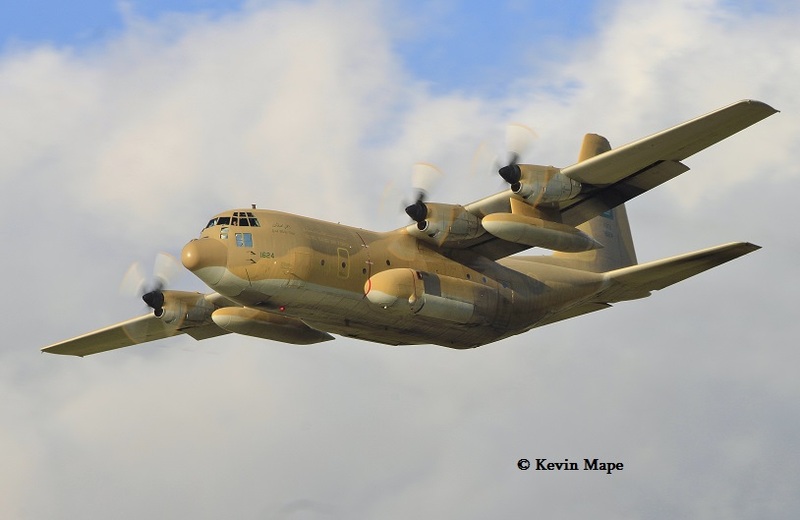 1625/16Sqn/C-130H Hercules c/s “RSF 3906” – To Coningsby – -Departed. 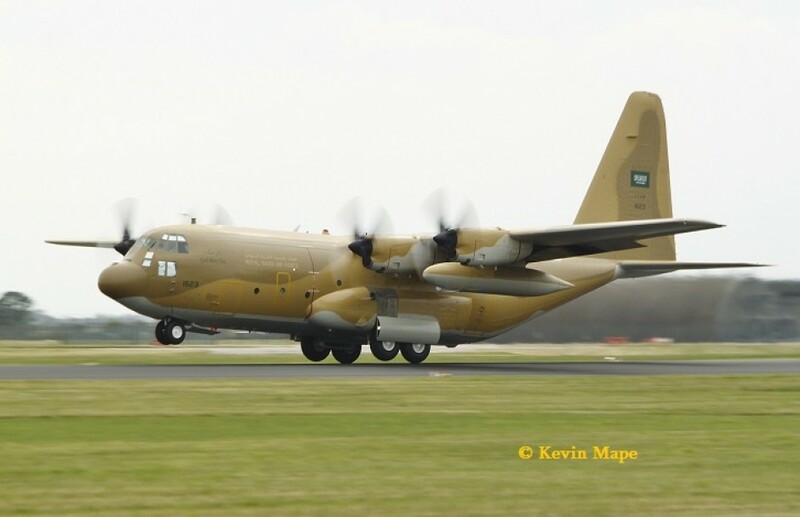 The 4 C-130H Hercules were on 2 hour turn rounds with relief crews in place at Coningsby for the return to Saudi Arabia. 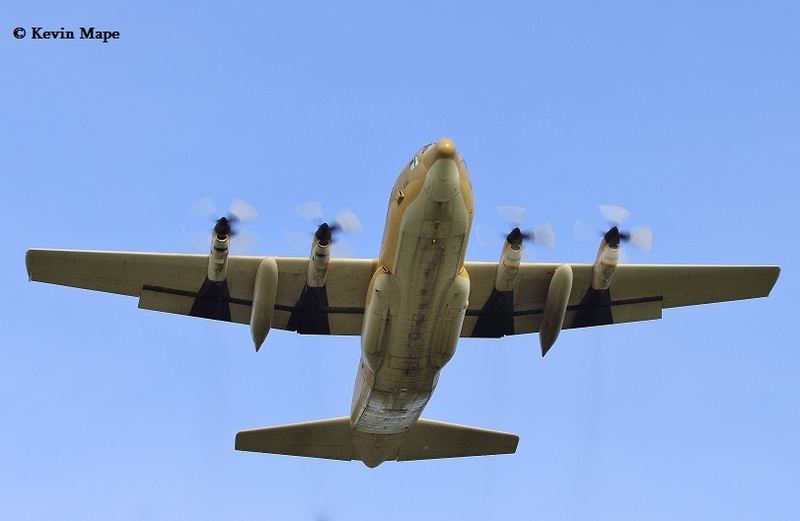 475/4Sqn/C-130H Hercules c/s “RSF 3908” – To Coningsby – -Departed. 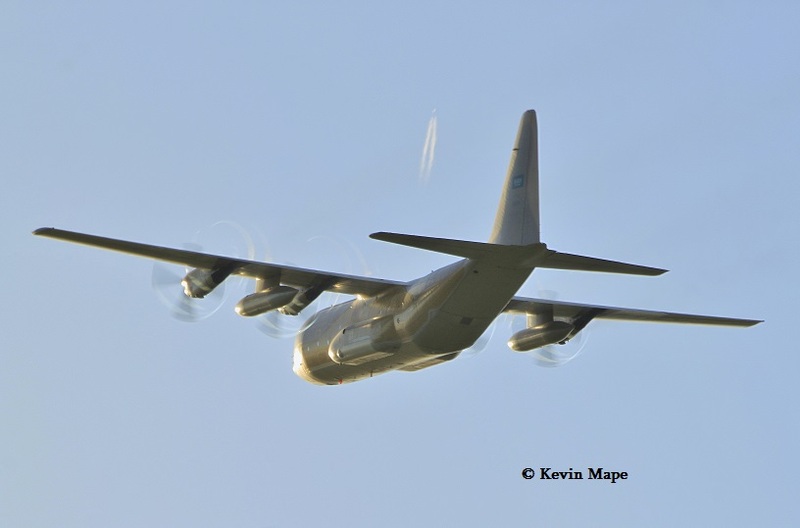 483/4Sqn/C-130H Hercules c/s “RSF 3907” – To Coningsby – -Departed. 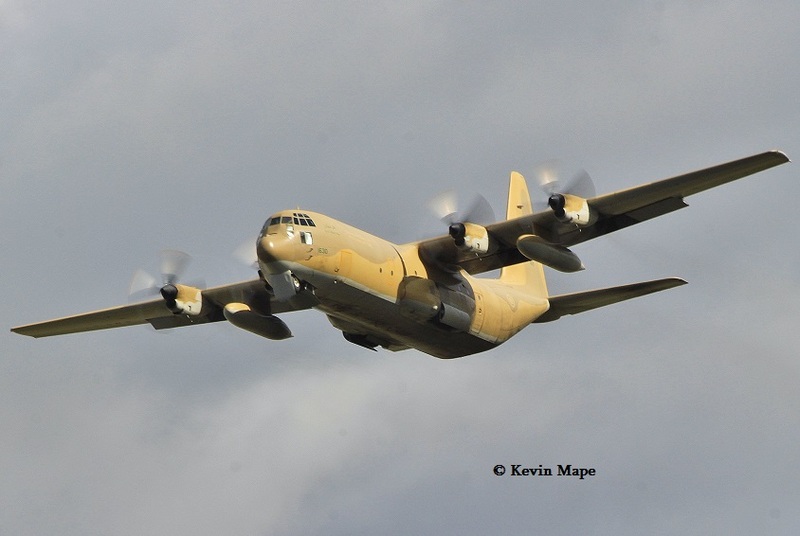 1623/16Sqn/C-130H Hercules c/s “RSF 3909” – To Coningsby – -Departed. 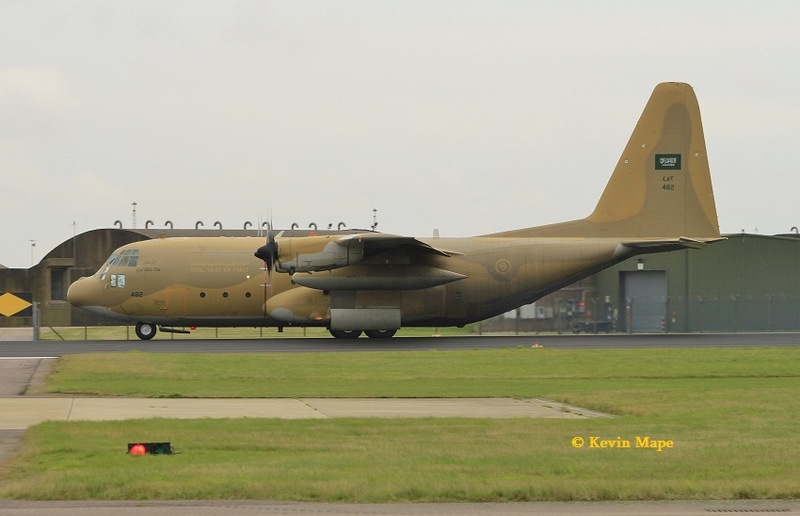 1625/16Sqn/C-130H Hercules c/s “RSF 3910” – To Coningsby – -Departed. 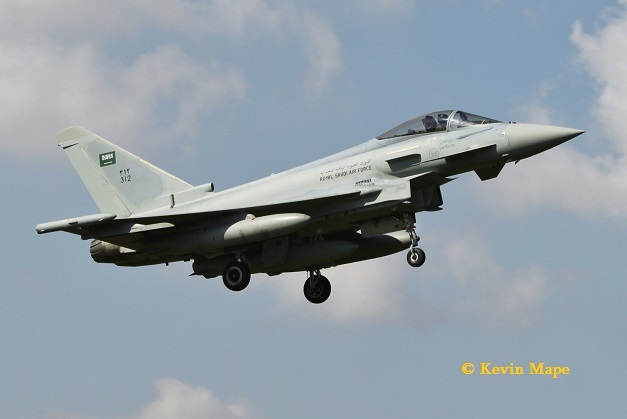 The same 4 Hercules again made the round trip to and from Saudi Arabia. 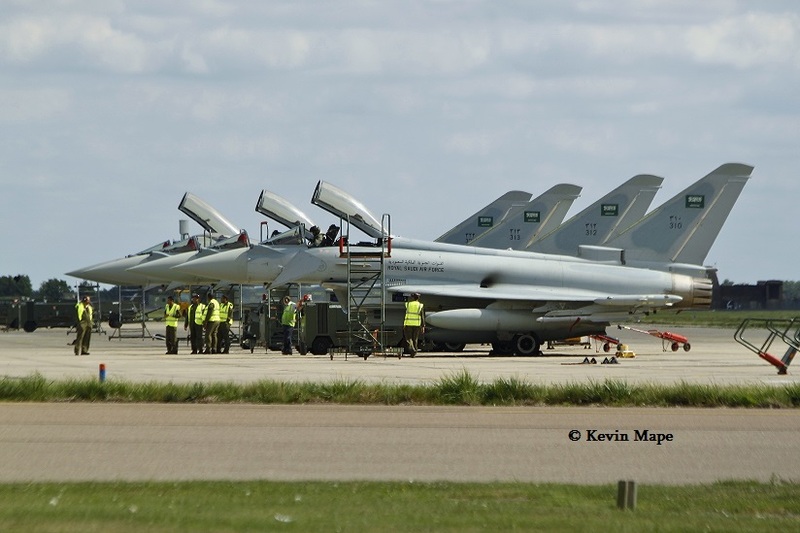 3 of the 4 Hercules again made the round trip to and from Saudi Arabia. 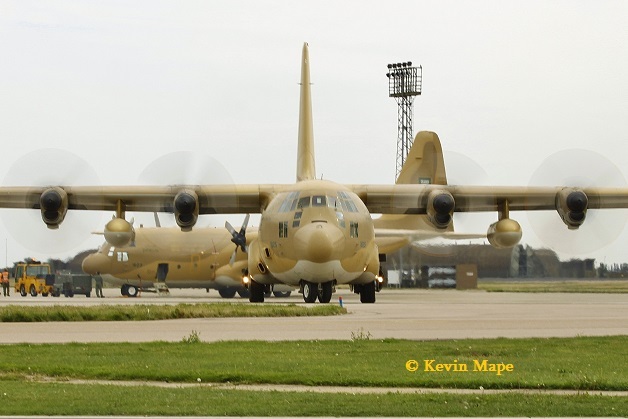 1625/16Sqn/C-130H Hercules c/s “RSF 3914” – To Coningsby – -Departed. 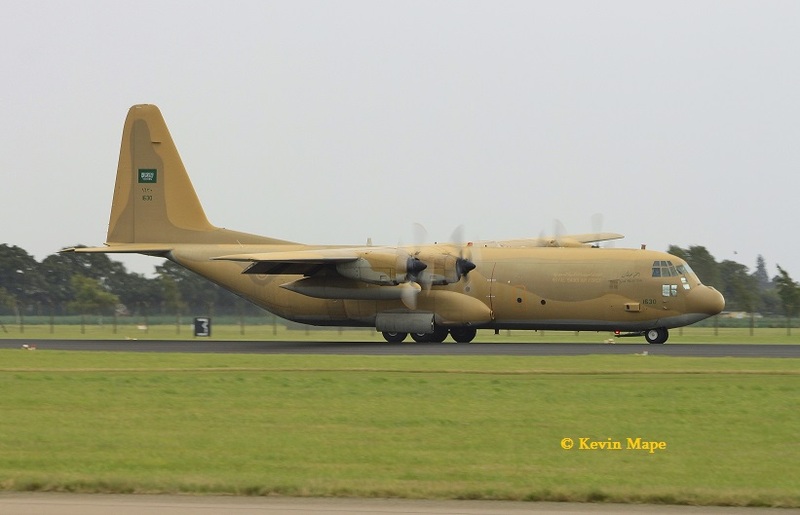 483/4Sqn/C-130H Hercules c/s “RSF 3911” – To Coningsby – -Departed. 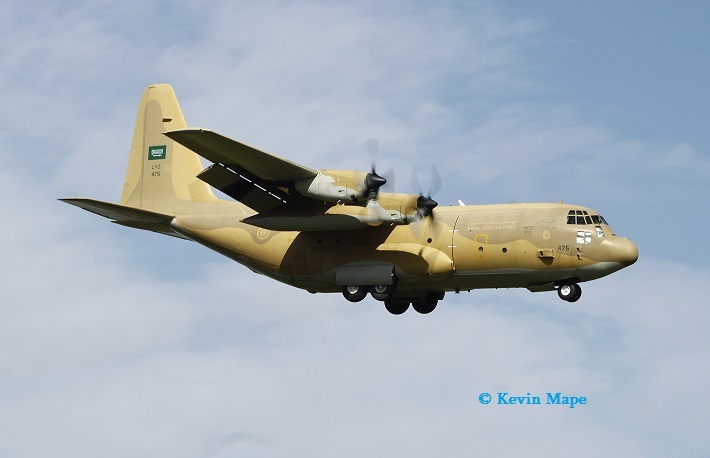 475/4Sqn/C-130H Hercules c/s “RSF 3912” – To Coningsby – -Departed. 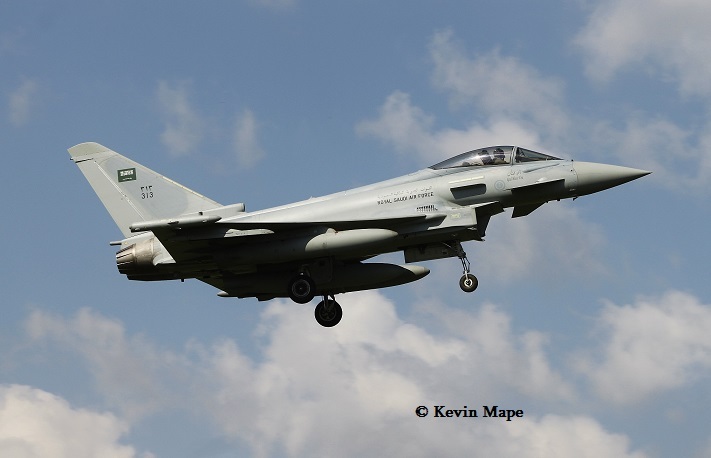 The main arrivals day for the Saudi Typhoons and Tornados, Only 2 of the 4 Tornados as 1 was still having problems in Italy. 2401/24Sqn/Airbus A330-243-MRTT c/s RSF 3882″ – To Brize Norton – night stopped. 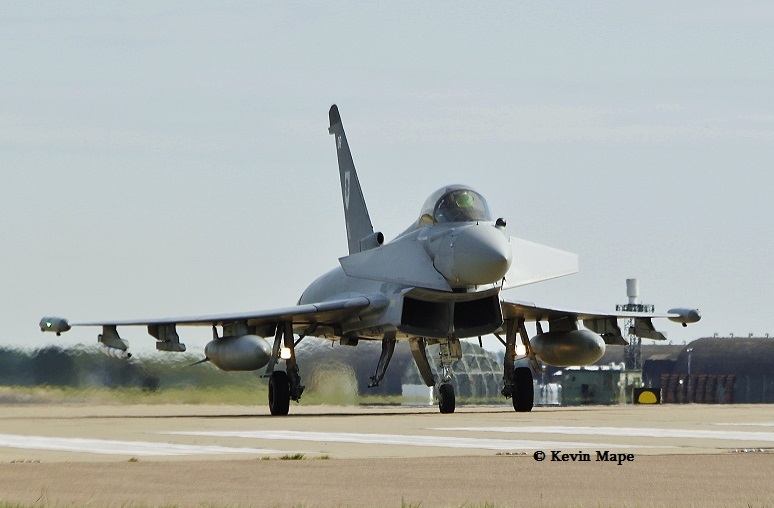 The first Airbus refuelled the four Typhoons . 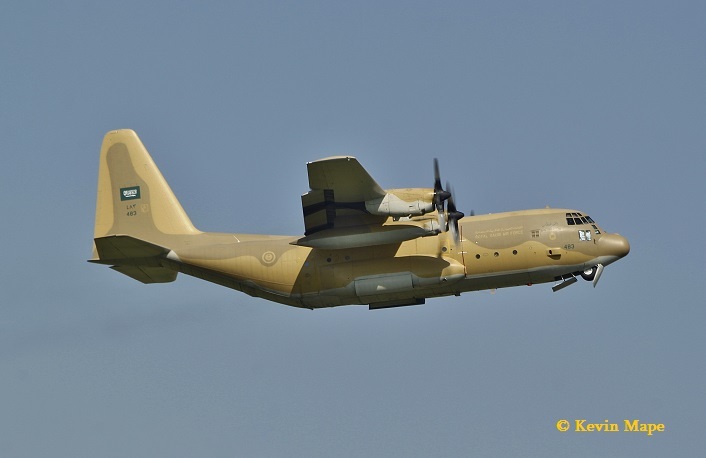 483/4Sqn/C-130H Hercules c/s “RSF 3922” – To Coningsby – -Departed. 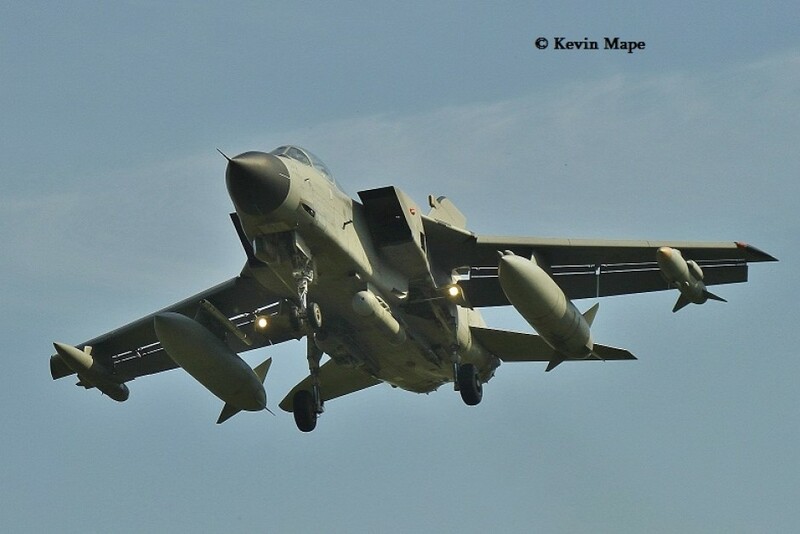 The late Hercules had some of the Tornado ground crew on from Italy. Photo :- 483 /4Sqn C-130H departing Coningsby 28th August. 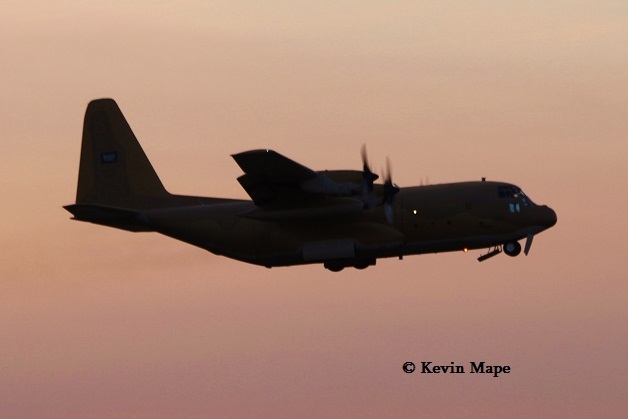 1625/16Sqn/C-130H Hercules c/s “RSF 3921” – To Coningsby – Departed. 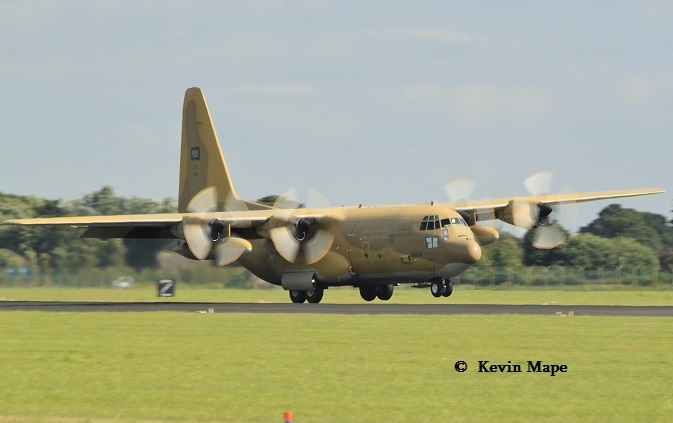 475/4Sqn /C-130H Hercules c/s “RSF 3920” – To Coningsby – Departed. 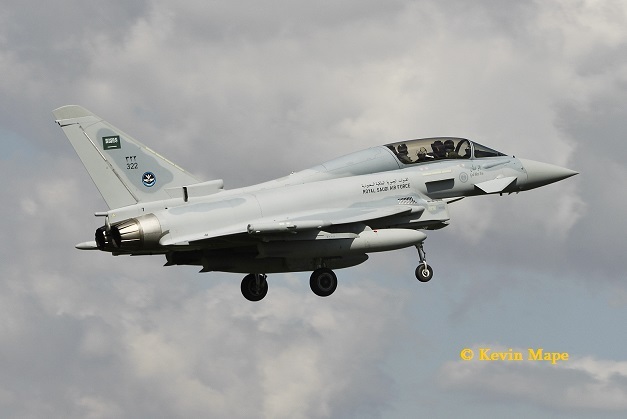 2401/24Sqn/Airbus A330-243-MRTT c/s RSF 3882″ – Brize Norton – Departed back to Saudi Arabia. 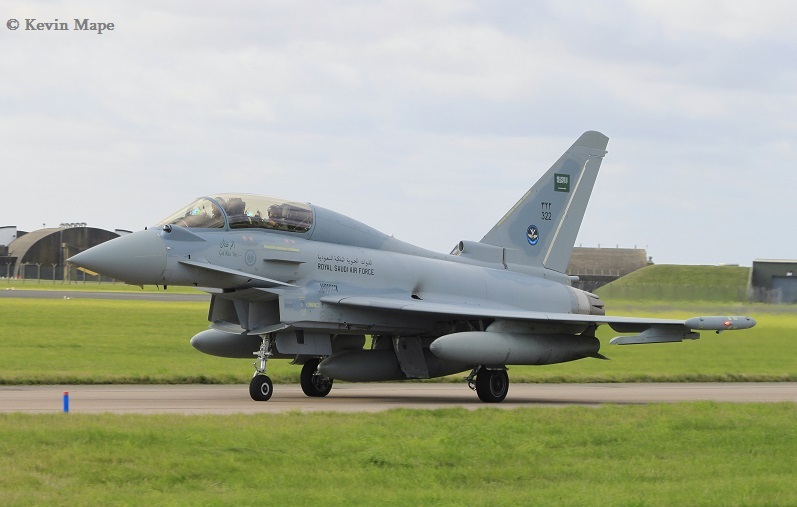 2402/24Sqn/Airbus A330-243-MRTT c/s RSF 3883″ – Brize Norton – Departed back to Saudi Arabia. 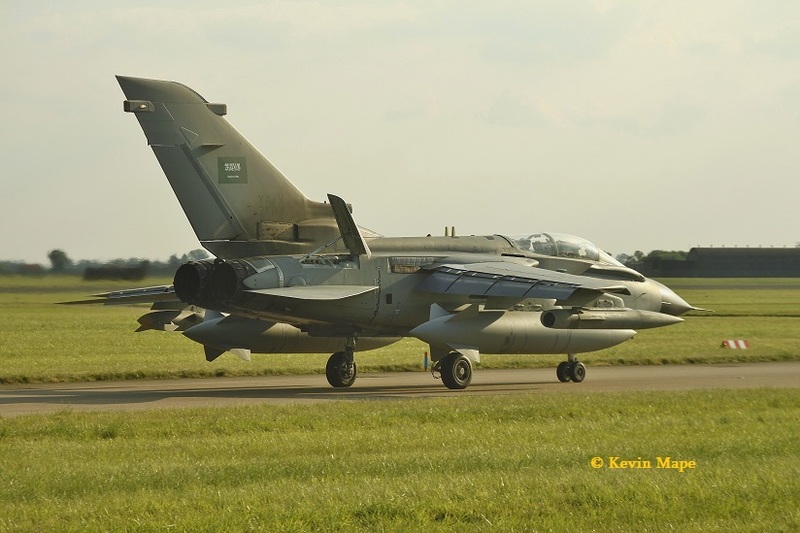 HZ-136/Royal Saudi Air Force/ Cessna 550 Citation IIB c/s “HZ136” – To Coningsby – night stopped. The Citation arrived from Italy in the afternoon. 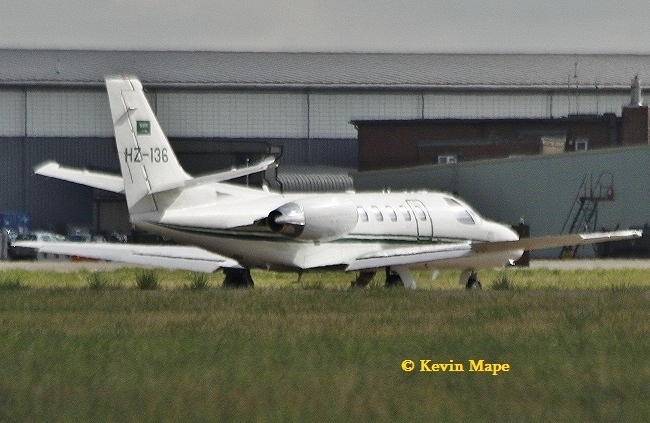 HZ-136/ Royal Saudi Air Force /Cessna 550 Citation IIB – At Coningsby- night stopped. Early evening arrivals from Italy in the late sun. HZ-136/Cessna 550 Citation II c/s “HZ136”- Departed. 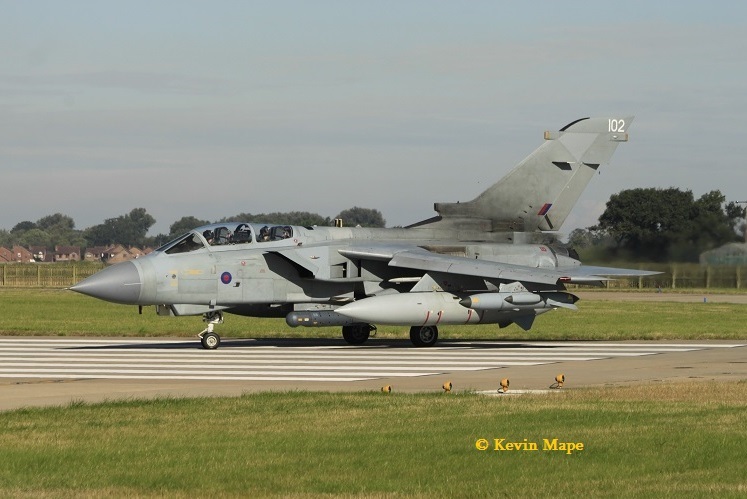 8312/75Sqn/Tornado IDS – Noted still on the ASP this morning. 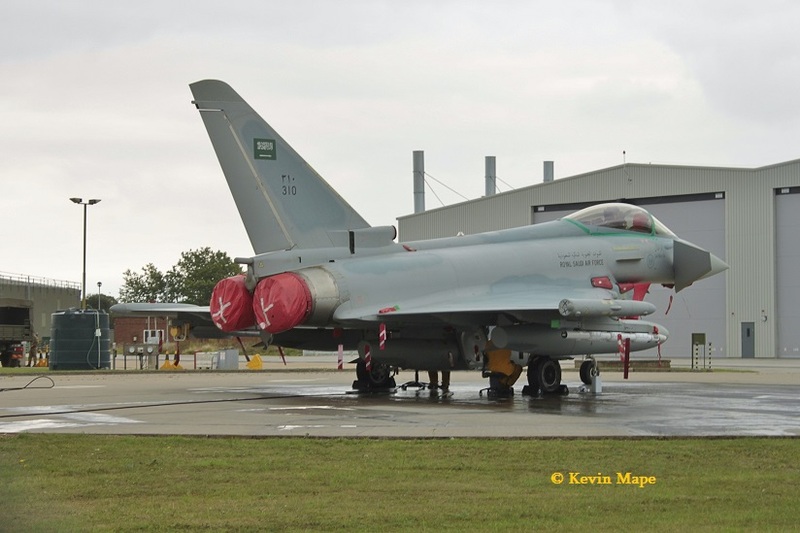 310/3Sqn/Typhoon FGR4- Engine runs on the ASP. 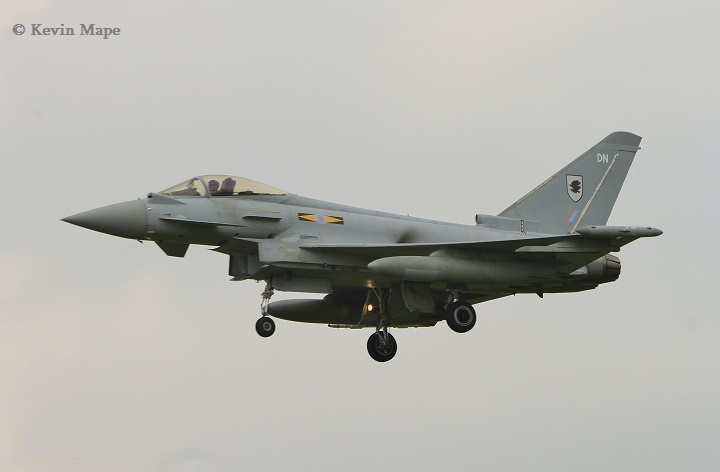 312/3Sqn/Typhoon FGR4- Engine runs on the ASP. 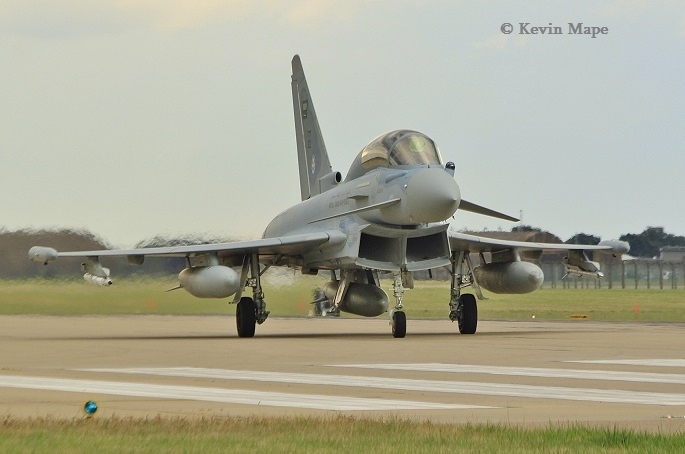 313/3Sqn/Typhoon FGR4- Engine runs on the ASP. 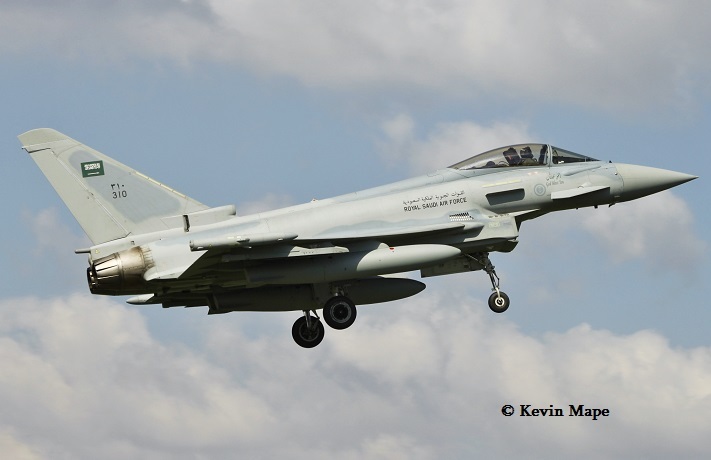 322/3Sqn/Typhoon FGR4- Engine runs on the ASP. No movements today. 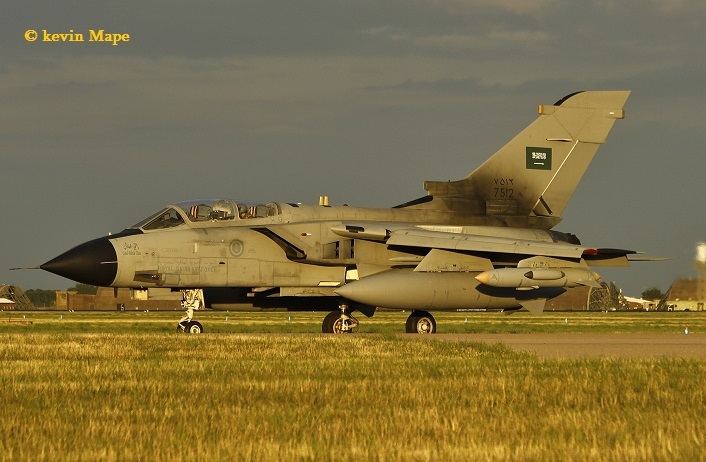 The 4 9Sqn Tornados are parked on the ASP with Covers over the front. 2nd Mon List thanks to Garf Smith. 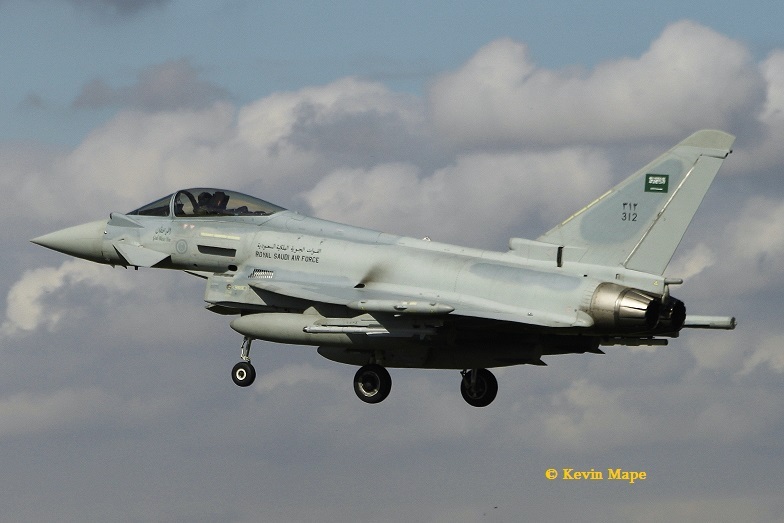 Today was the first of 2 days of flying one Saudi one RAF to familiarise the crews of each others Air Force. 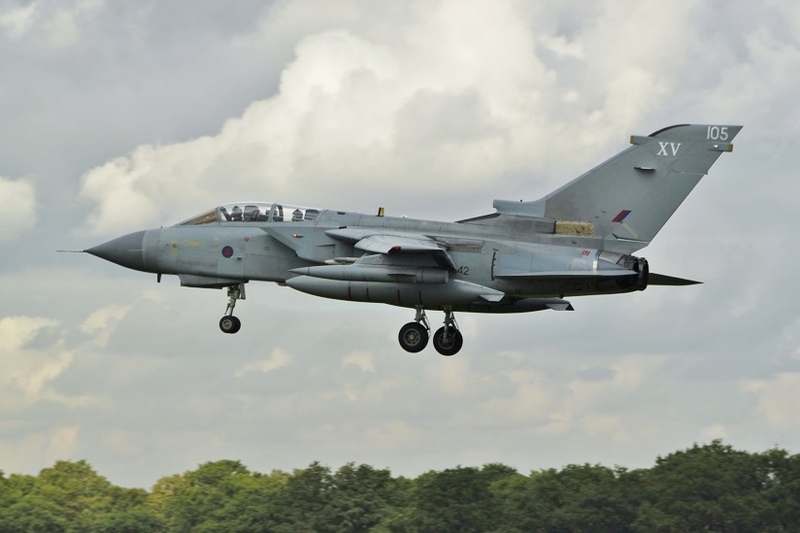 ZG705/118/9Sqn/Tornado GR4 – Towed over to the South side for engine runs. Day 2 was a similar missions to yesterday starting around 10am and 2 pm. 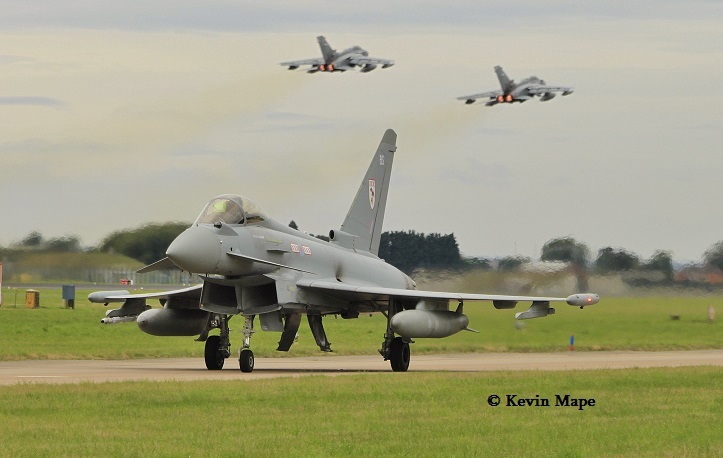 The main Exercise started today with the first missions leaving Coningsby about 10am, The afternoon missions leaving just before 2pm. 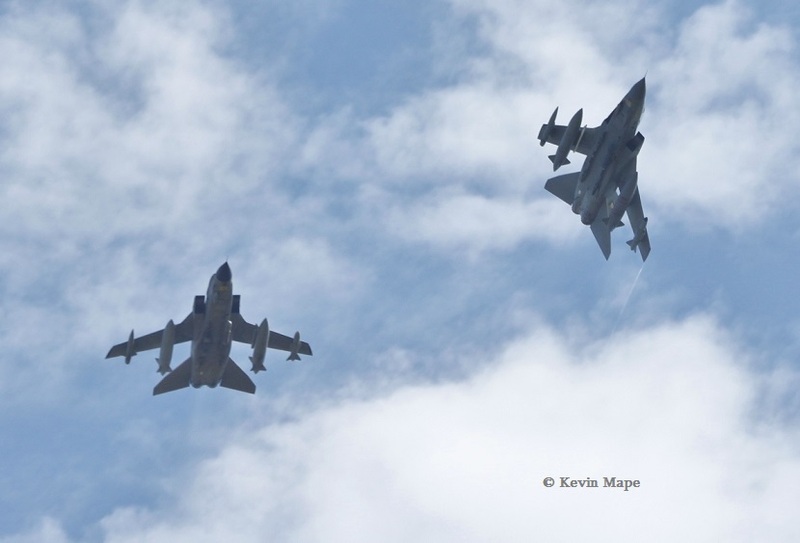 Flown in the afternoon was a 4 ship consisting of two Typhoons & two Tornados one from each Air Force. 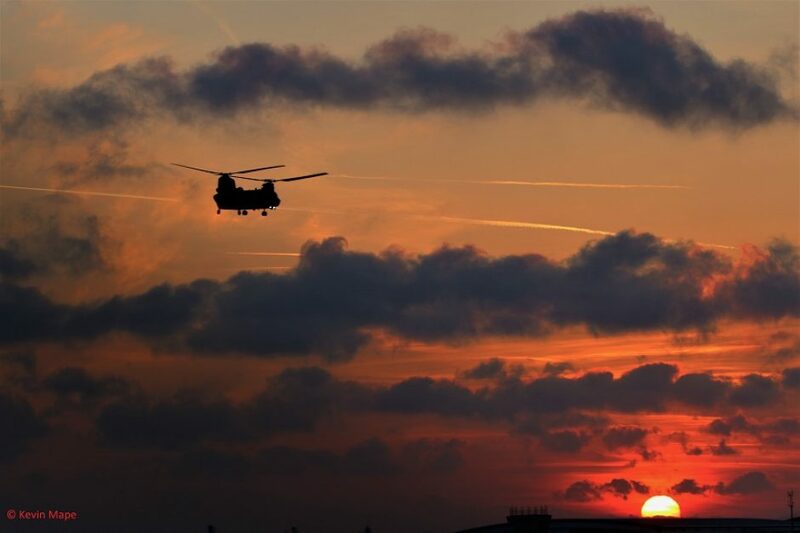 Vast numbers of people have converged around the base to view and photograph the Exercise . 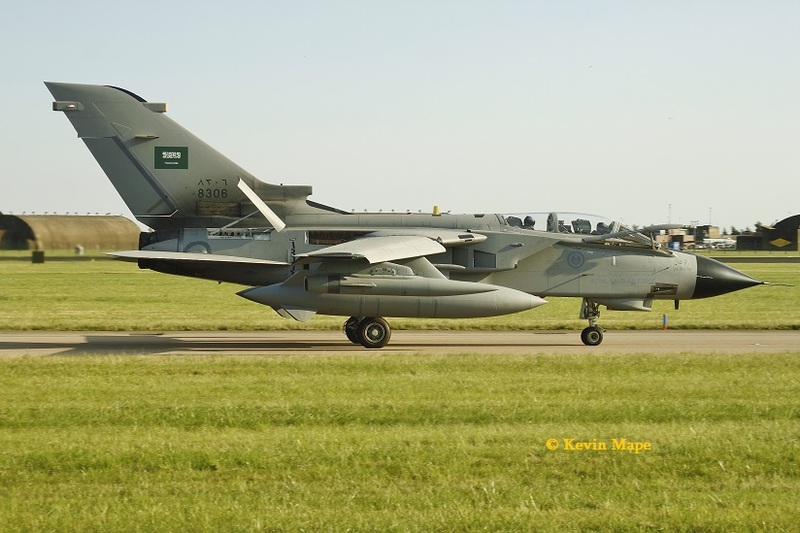 ZD842/105/9Sqn/ Tornado GR4 c/s “Gringo 11”- Flew with Saudi :- Both went to Holbeach Range. 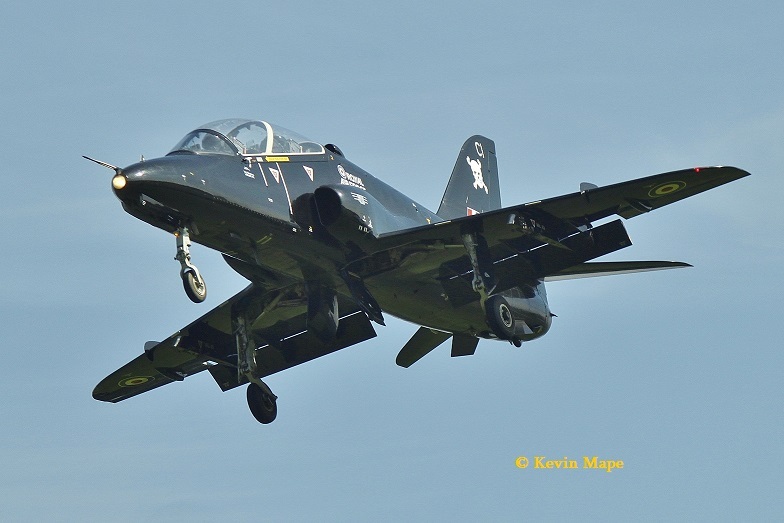 XX321/CI/100Sqn/Hawk T1A c/s “Pirate 04” – To the ASP – For Photo shoot pm. 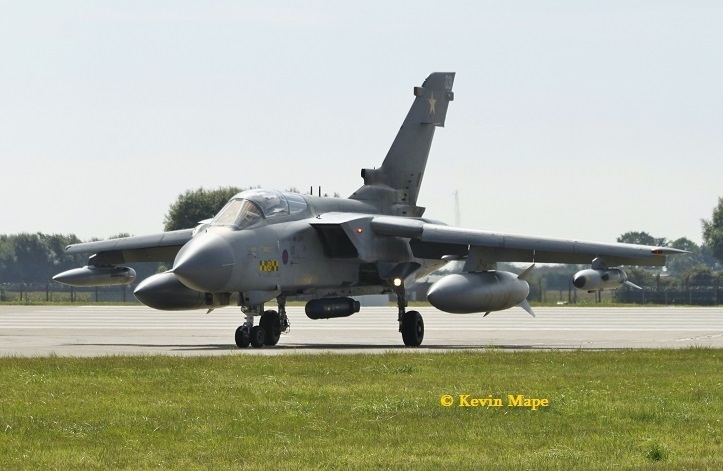 G-FRAW/AW/Cobham/Falcon 20 c/s Vader 1″ – Returned to ASP after mission. G-FRAW/AW/Cobham/Falcon 20 c/s “Zodiac 31” – Returned to ASP after mission. 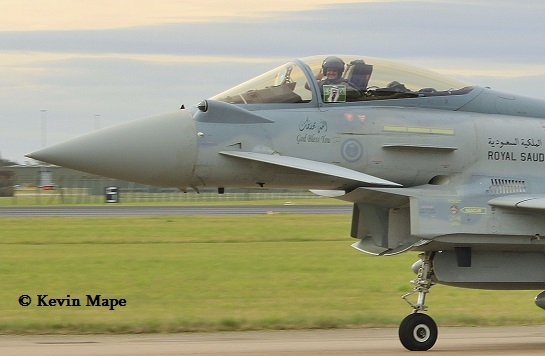 322/3Sqn/Typhoon T53 c/s ” Rampage 14″- Chute deployed on landing. 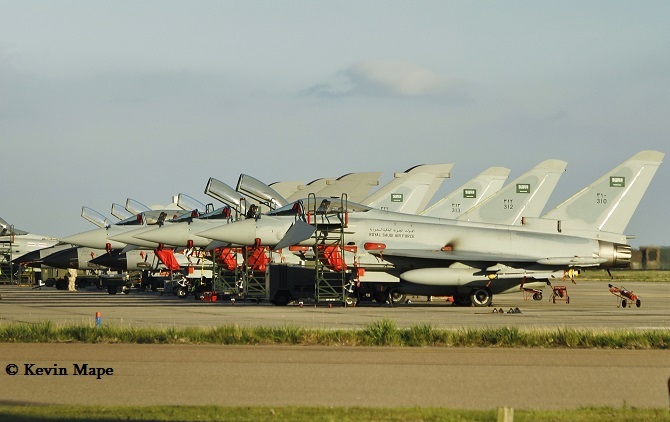 All aircraft were towed away into the Hangars for the weekend. 486/4Sqn/C-130H c/s “RSF 4121” – Into East Midlands Airport. 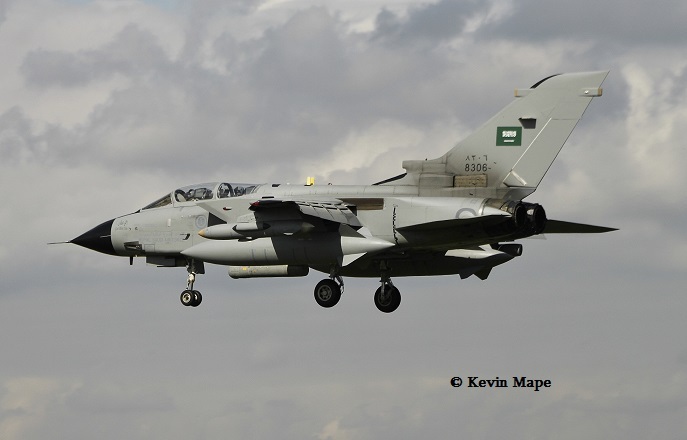 This marked the end of the Fast Jet element of Exercise Green Flag . 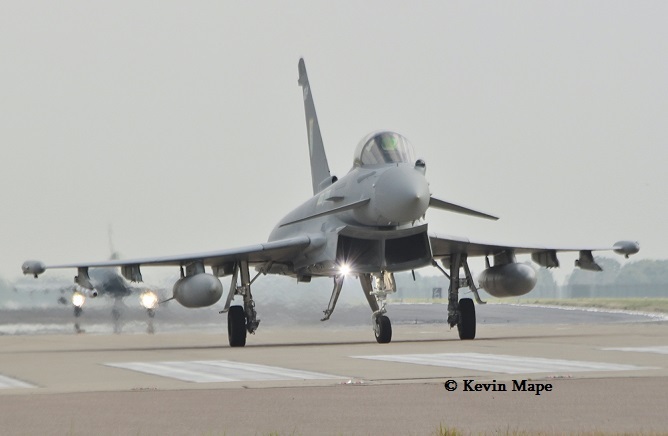 Two Typhoon ZJ917/QO-G & RSAF310 and two Tornado ZA472/031 & RSAF 8312 were positioned on the ASP as a back drop to the official Photo’s of the people involved at Coningsby in the shape of a Typhoon. In the afternoon a small display took place . 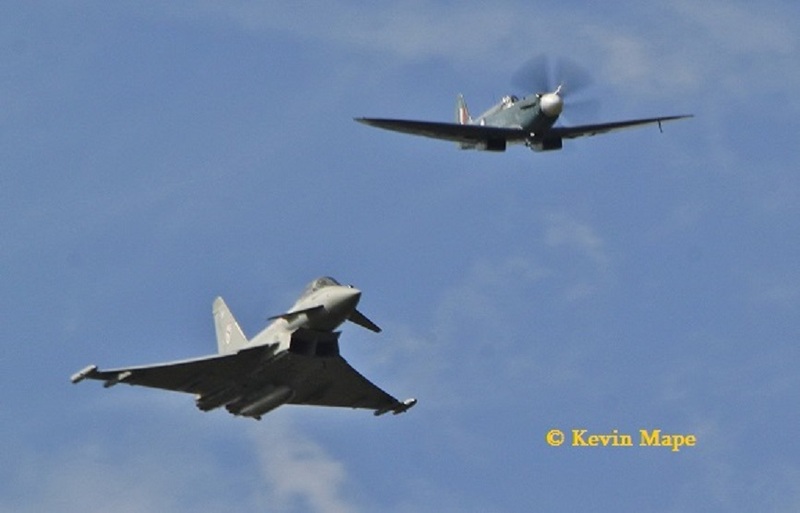 ZK307/BU/29(R)Sqn marks/Typhoon FGR4 flew some flypasts with Spitfire PR.XIX PS915 in formation, Next the Typhoon did his display then departed to Liverpool, Followed by a display from Spitfire PS915 and a small display by the Lancaster before his departure to Jersey. 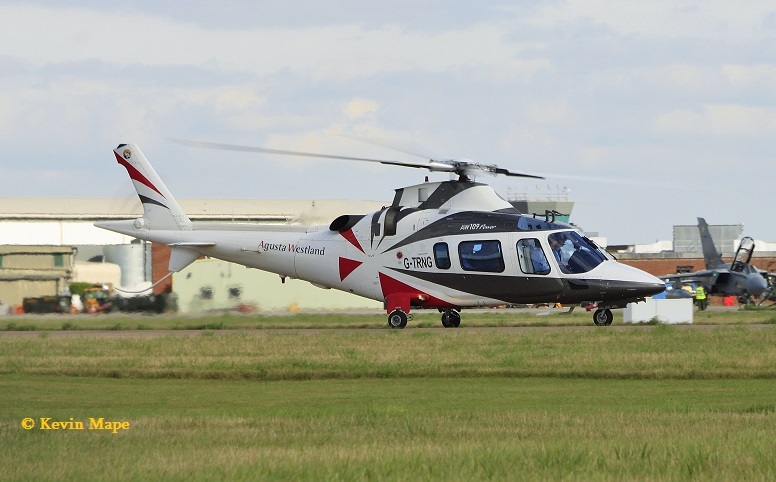 G-TRNG /Agusta/Westland/A-109E Power c/s “Ascot 1624” – Departed after the display. 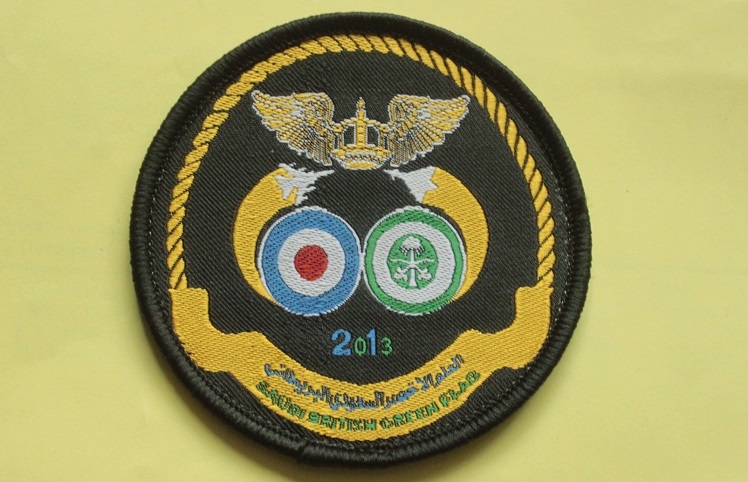 2402/24Sqn/Airbus A330- MRTT c/s “RSF 3872” – Into Brize Norton – N/S. 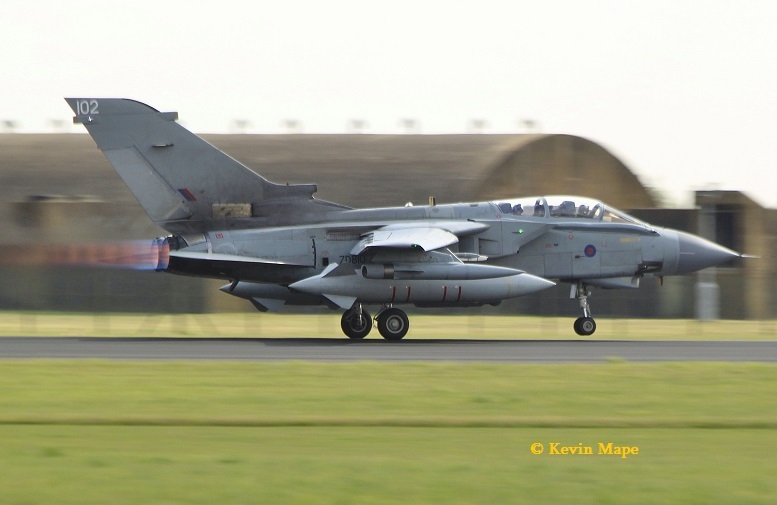 ZA472/031/31Sqn marks/Tornado GR4 c/s “Deathray 3″ – Returned to Marham via Wales. 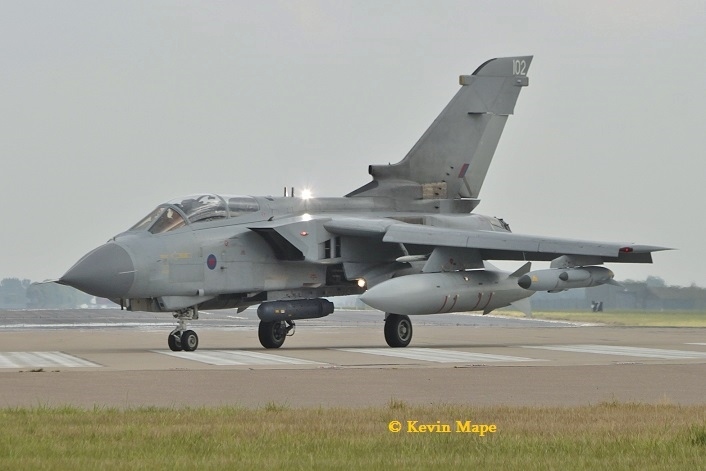 ZG705/118/Unmarked/Tornado GR4 c/s “Deathray 1″ – Returned to Marham via Wales. 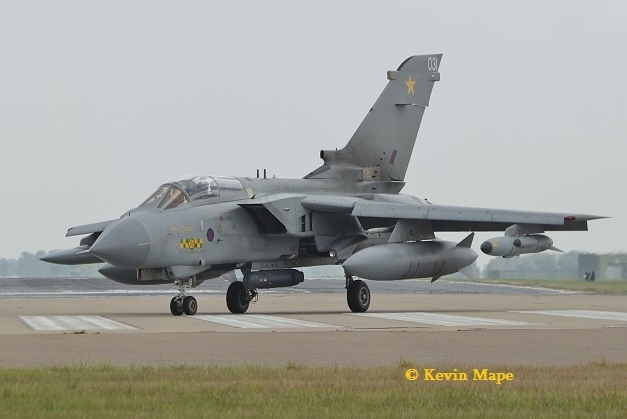 ZD810/102/Unmarked/Tornado GR4 c/s “Deathray 2″ – Returned to Marham via Wales. 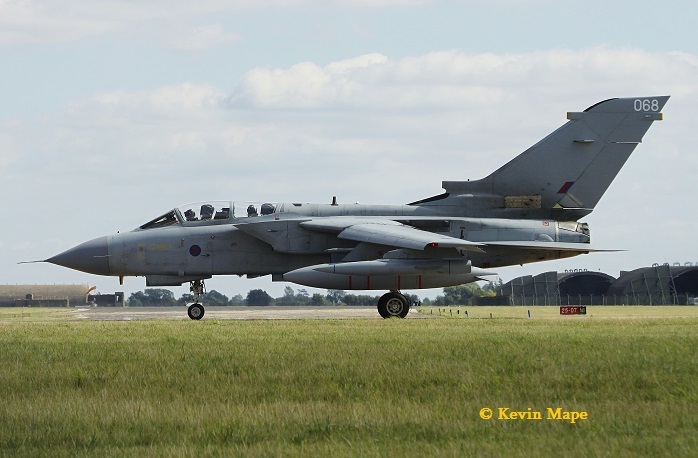 Well it has been a very busy 2 weeks at Coningsby, I will remember it as the last time we will see large numbers of Tornado operating out of Coningsby. 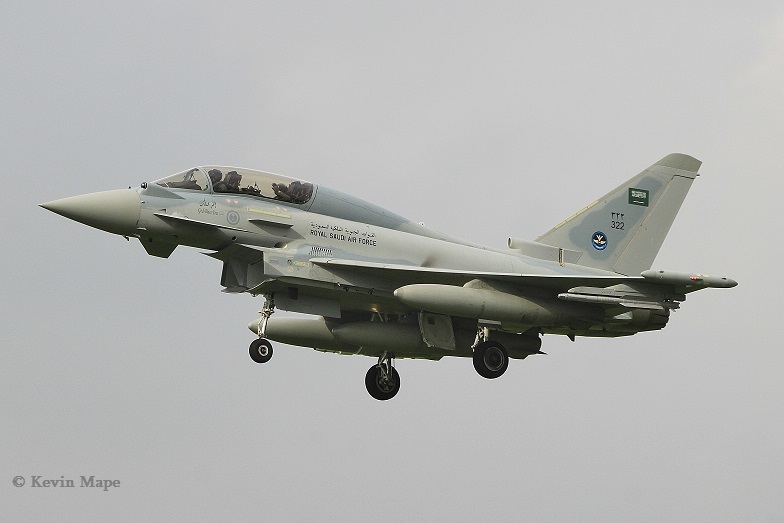 The next phase is to get the Saudi aircraft back home safely. 2402/24Sqn/Airbus A330- MRTT c/s “RSF 3872” – Departed Brize Norton this morning. 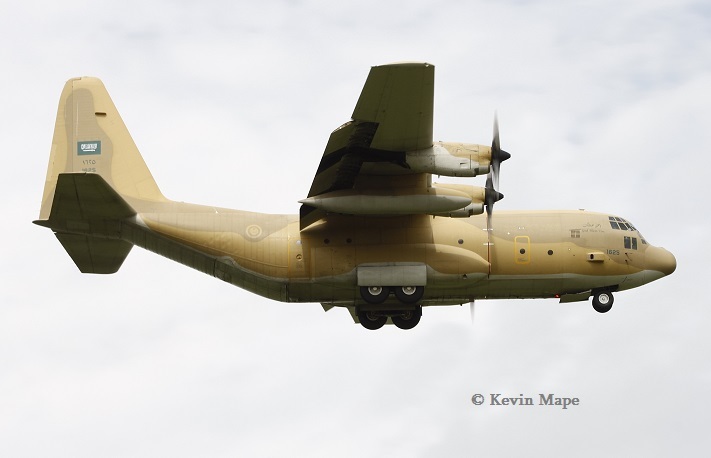 1624/16Sqn/C-130H Hercules c/s “RSF 4122” – Departed Coningsby at Lunch time. 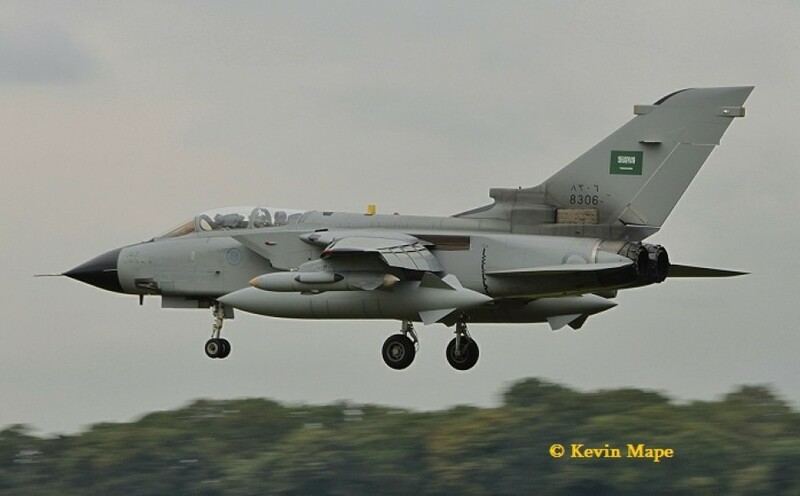 I was time this morning for the Saudi Fast jets to start heading home, I think everyone that visited the base will leave with happy memories of a great 2 weeks of flying. 4203/42Sqn/Airbus A330- MRTT c/s “RSF 3885” – Departed Brize Norton. 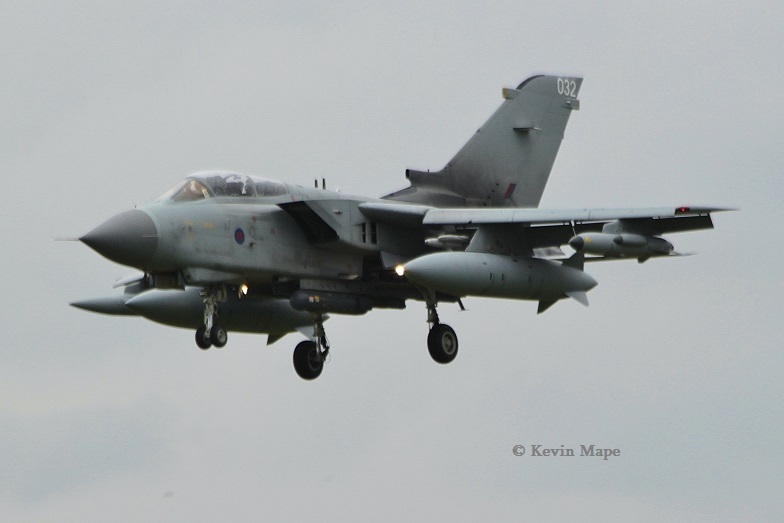 7507/75Sqn/Tornado IDS c/s “Green 01 flight”- Departed Coningsby for home 9-00am. 4201/42Sqn/Airbus A330- MRTT c/s “RSF 3884” – Departed Brize Norton. 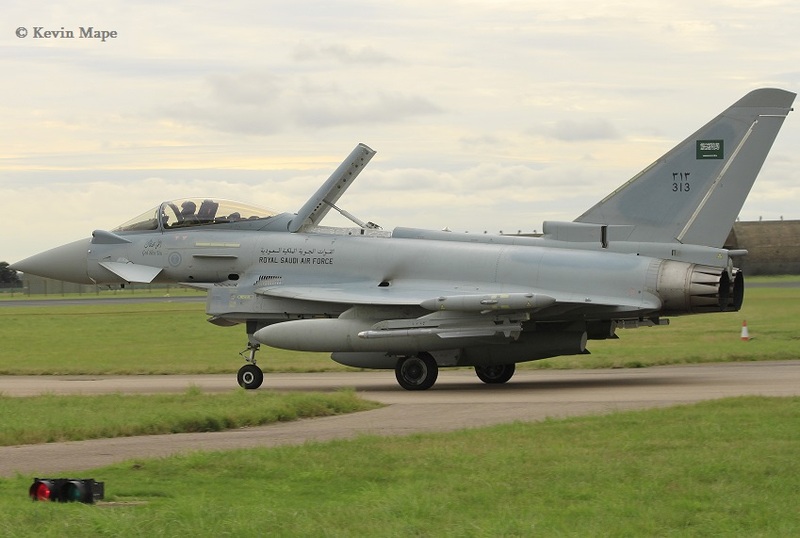 322/3Sqn/Typhoon T53 c/s “Master 01 flight” – Departed Coningsby for home 10-00am. 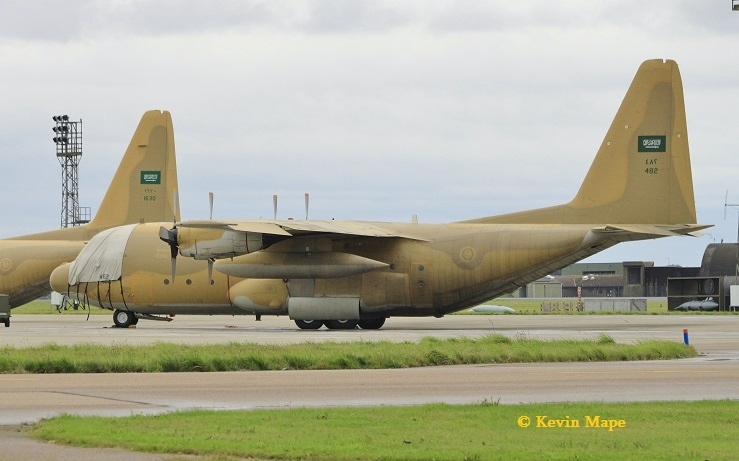 1630/16Sqn/C-130H-30 Hercules c/s “RSF 3975″ – Departed Coningsby for Saudi. 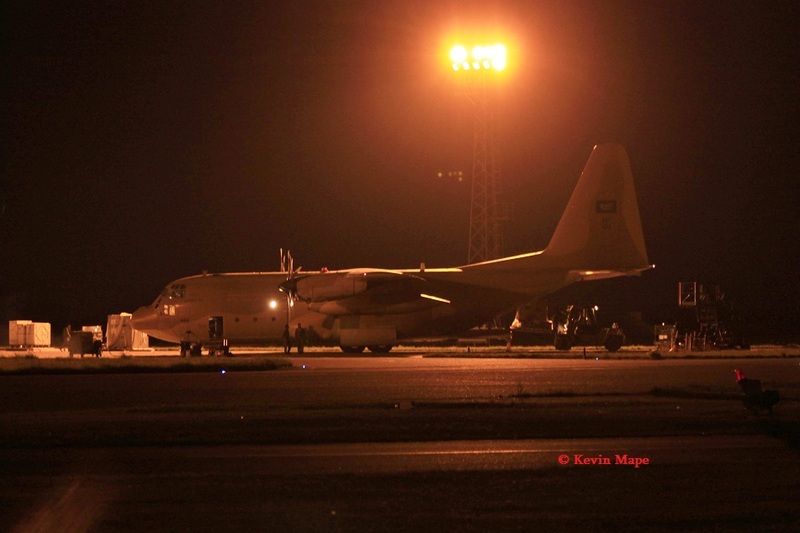 1624/16Sqn/C-130H Hercules c/s “RSF 3977” – Parked on the ASP – Departed. 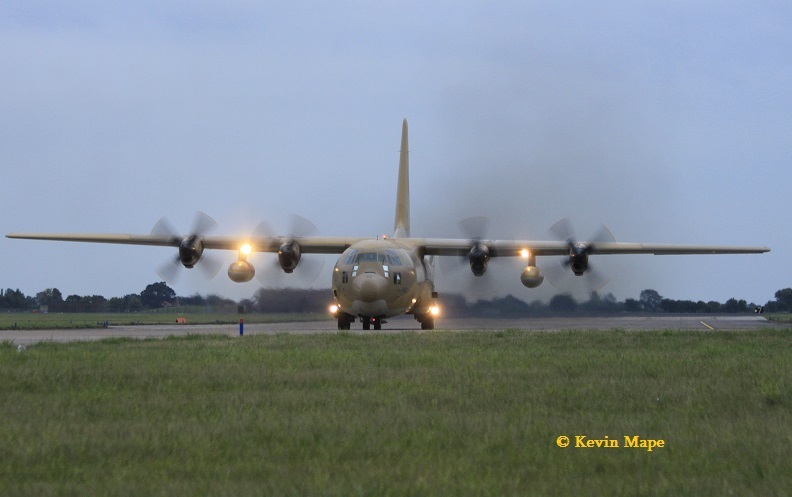 482/4Sqn/C-130 Hercules c/s “RSF 3974″ – Departed Coningsby. 486/4Sqn/C-130H Hercules c/s “RSF 4121” – From East Mildlands – Departed to East Midlands. 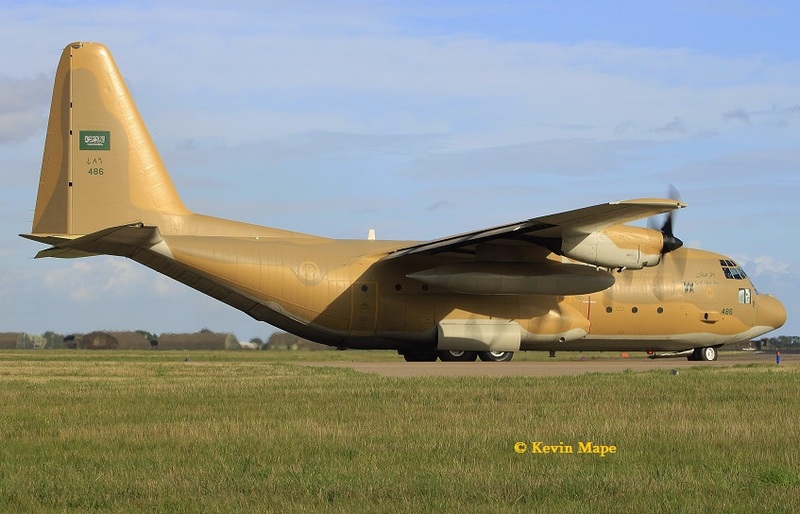 482/4Sqn/C-130 Hercules c/s “RSF 3978″ – Parked on the ASP- Departed Coningsby. 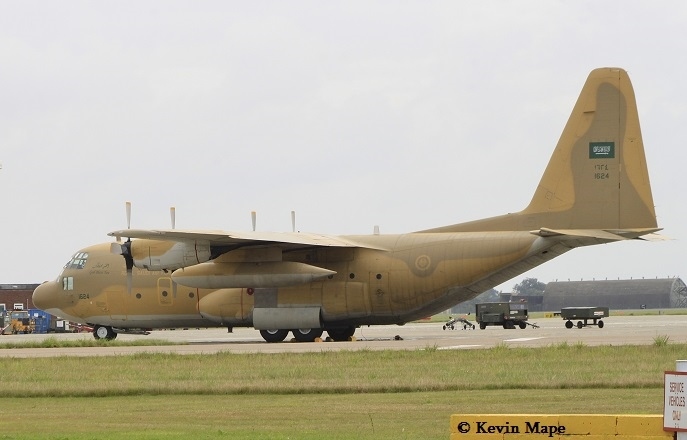 482/4sqn/C-130H Hercules c/s “RSF 3984 -Parked on the ASP – Departed Coningsby. 1624/16Sqn/C-130H Hercules c/s “RSF 3979” – Parked on the ASP- Departed Coningsby. 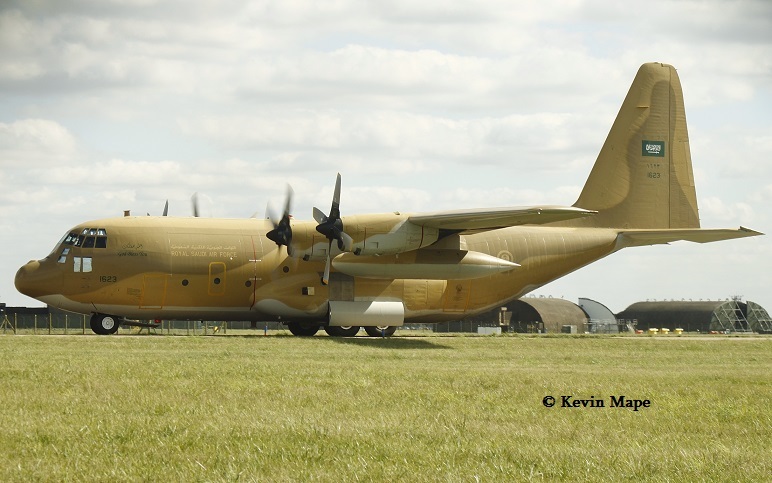 1623/16Sqn/C-130H Hercules c/s RSF 3983″ – Parked on the ASP – Departed Coningsby. 1622/16Sqn/C-130H-30 Hercules c/s “RSF 3982” -Parked on the ASP. Departed. 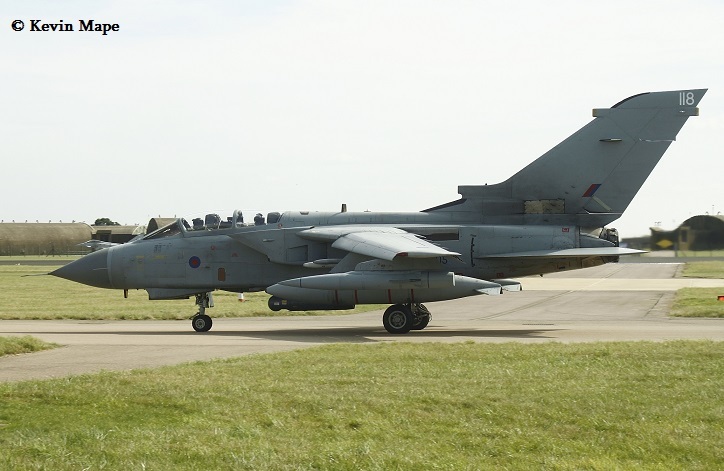 The compound outside 29Sqn Hangar is now empty, These could be the last movements for Exercise Green Flag 2013. 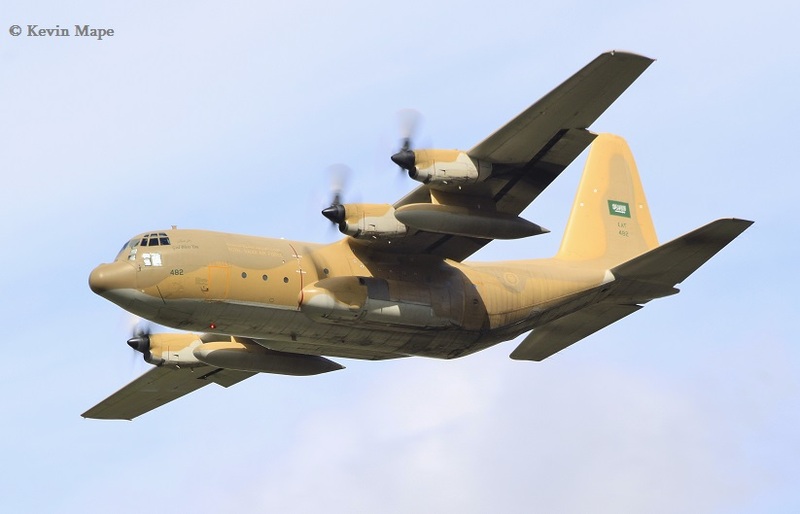 In total 9 different C-130H Hercules supported this Exercise flying into Coningsby ,The Royal Saudi Air Force made 27 Herc flights before and after the event.